For a little over two weeks from August 13 to August 28, 2016, 24 first year undergraduate students took part in the 33rd START Program*. Led by Associate Professor Ayami Nakaya (Graduate School for International Development and Cooperation) and two other faculty members, the students went to Universitas Brawijaya (UB) in Malang, East Java, Republic of Indonesia. For a little over two weeks from August 21 to September 5, 2016, 30 first-year undergraduate students took part in the 34th START Program. Led by Associate Professor Naoki Maeda (Graduate School of Social Sciences) and two other faculty members, the students went to National Chengchi University in Taiwan. For a little over two weeks from September 2 to September 19, 2016, 30 first-year undergraduate students took part in the 35th START Program*. Led by Associate Professor Aaron Claude Sponseller (Graduate School of Education) and two other faculty members, the students went to Flinders University in Adelaide, Australia. For a little over two weeks from September 10 to September 25, 2016, 30 first year students participated in the 36th START Program. Led by Fuyuko Takita (Associate Professor at the Institute for Foreign Language Research and Education) and two other supervising faculty members, the students spent this time living and studying at James Madison University (JMU) in Virginia, U.S.
(*) The purpose of the START Program is to provide opportunities for first year students with little or no experience in traveling overseas the chance to go abroad, visit our partner universities, and develop a deeper interest in international exchange and studying abroad. Established in 2010, by the end of the first half of the academic year 2016 the START Program has already been held 36 times. 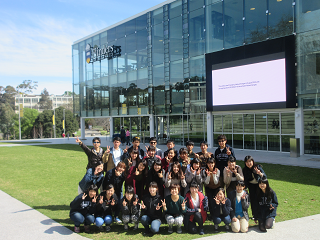 This program is financially supported by the Hiroshima University Fund, which reduces participating students’ financial burden and opens up a gateway for more students to play an active role in this globalized world. Participating students spend about two months before departure in a pre-training program and, having arrived home, start a post-training program. Moreover, the START Program is offered as a general education credited course (‘overseas field study’), and aims to improve participating students’ global core competency (the core skills needed to succeed anywhere in the world). The students are asked to complete self-assessments of their global core competency skills and to make action plans at least three times; before leaving, while abroad, and once home. After consulting with their supervising professor, each student must then revise their action plans and make the effort to see it through. One’s global core competency and grade is then measured comprehensively by considering each student’s participation during the program, final presentation, and post-study abroad report. Furthermore, participating students must each set a goal for the TOEIC test, and continue their language studies after completion of the program. For details of START Program, click here.